Spagnuolo's Chocolate in downtown Owosso. Leave it to us to find the chocolate shop in town. On our way to Owosso, we saw billboards for “historic downtown Owosso.” After eating lunch at the Wrought Iron Grill, we decided to find downtown and see what the billboards were all about. On our first pass through town, we saw a little candy store that still had an “open” sign lit up. We went around the block to find a parking spot then headed back for some dessert. 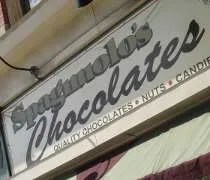 Spagnuolo’s Chocolate has a tiny store front on Main Street. We parked around the corner where there is some angled parking. In front of the store, there are some parallel spots, but I didn’t realize that and the walk didn’t hurt us any.